Betal put forward another puzzle to Vikram. A woman called Leelavati married a thief. After marriage the man decided to quit stealing. However, when they had a son, the man found he had no money to support his family and went back to stealing. After his death, Leelavati married a businessman. The businessman loved his family and raised the child well. Just when the boy took charge of the business, his parents died. 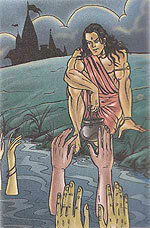 While performing their last rites in the river, three hands came out claiming the offering. The boy recognised his mother's voice and offered prayers to her, but he couldn't make out which pair of hand was his father's. At this point he recalled his mother once mentioning his real father. Betal stopped the story here and asked which father was finally given the offering. "The businessman," replied Vikram. "Because he had showered his love and reared the child, while the thief had only given him birth." Again, Betal flew away.